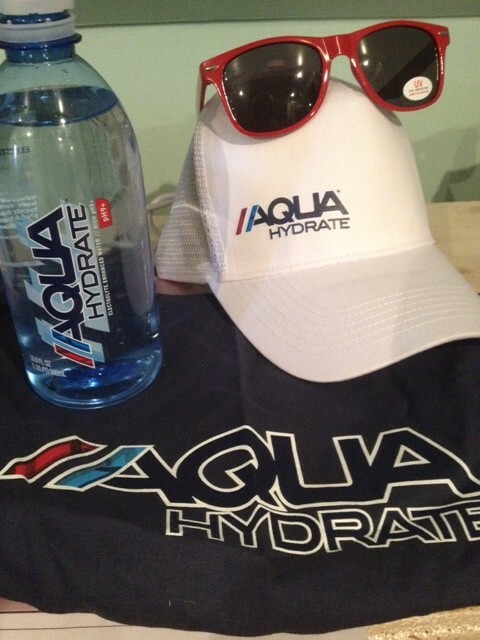 AQUAhydrate reached out to me and asked if I wanted to try their Electrolyte Enhanced Water. I happily obliged- I am an avid gym goer, and even with the warm weather it is easy to have an electrolyte imbalance whether you sweat out a lot of sodium, don’t eat enough potassium, etc. 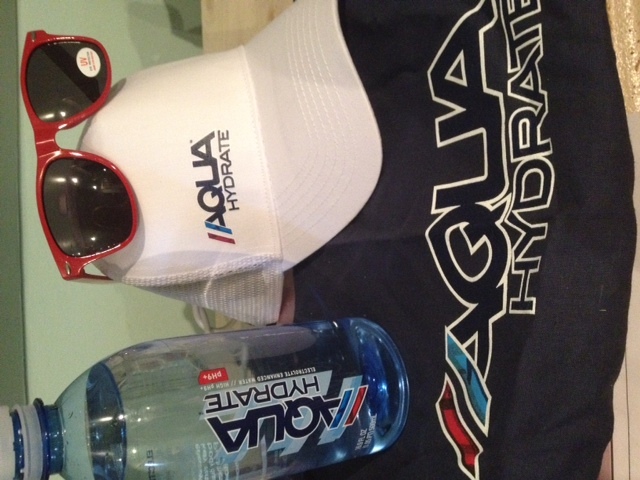 So I got sent a few bottles of their Electrolyte Enhanced Water, along with this cute package of a hat, sunglasses, and a tote! Thanks guys! This water has a pH of 9+, so it is on the basic side from a pH scale of 1-14. 7 is a neutral rating, and anything below 7 is considered more acidic (think lemon juice!). According to the label, “normal bottled water” has a pH rating of about 7.5, and this water has one in the 9-10 range. If you would like to read more about why they have a higher pH level, please visit their website here. There are some trace minerals in the water as well. Magnesium, Selenium, Manganese, Molybdenum, Chloride, Chromium, Copper and Zinc are all added but in very teeny amounts. As for the taste? This water is great! I know, I know… Uh…it’s water? But TRUST ME I have had some nasty bottled water before. You CAN taste the difference. This water tastes super crisp and fresh,and has a very clean feel to it. I loved it. I received about 4 bottles of the water and drank it right away…and then noticed the difference when I went back to my other normal bottled water. Poland Spring..I love you man, but Aqua Hydrate may be your close cousin for top flavor in my opinion. I got some samples to try for free from Thin Slim Foods! This company makes desserts, breads, bagels and more that are lower in calories and carbs than traditional fare. 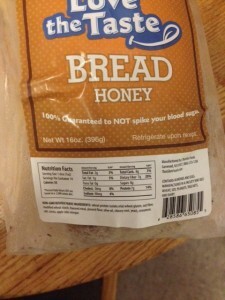 I was lucky enough to get a loaf of the Honey and Plain bread, as well as 2 of the brownies to try. I was definitely intrigued by these foods. Being a Diabetic, I try to keep my carbohydrates on the lower side, as it allows for better blood sugar control (carbs= the devil for me sometimes!). Don’t get me wrong, I DO miss my breads, bagels, etc. so it is nice to hear of companies that make products that are lower in carbs and calories! First things first…the brownie! I haven’t had a full brownie in ages. I bake a lot, but seldom eat what I bake- and moreso taste it so make sure it is good, and give it away for others to enjoy. The brownie is 45 calories, 20 carbohydrates (8 of which is fiber), 0 grams of sugar, 10 sugar alcohols, and 6 grams of protein. It’s a nice thick sized brownie…and the whole thing 45 calories? I was skeptical. I bit into it. 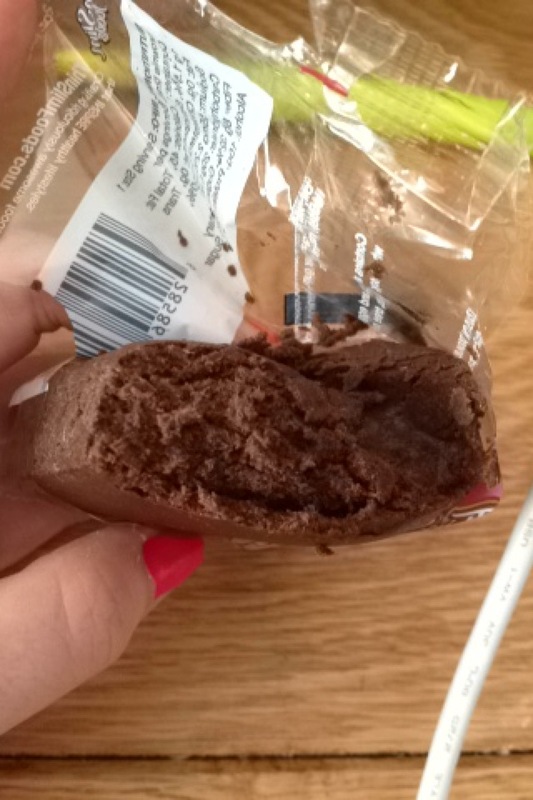 It was definitely a cakey brownie, with a strong cocoa powder flavor. It was on the dry side, and a little pasty. It had a sweetness to it- but you could tell it wasn’t from sugar, but rather from a non caloric sweetener. Being a diabetic, I can spot that flavor miles away! I like it, and sort of am forced to like it since I can’t eat sugar, but it’s definitely not for everyone. The brownie is lackluster, but it is chocolately. I think it needs a smear of peanut butter or some sugar free chocolate chips thrown in there to be more appetizing. 2 stars. 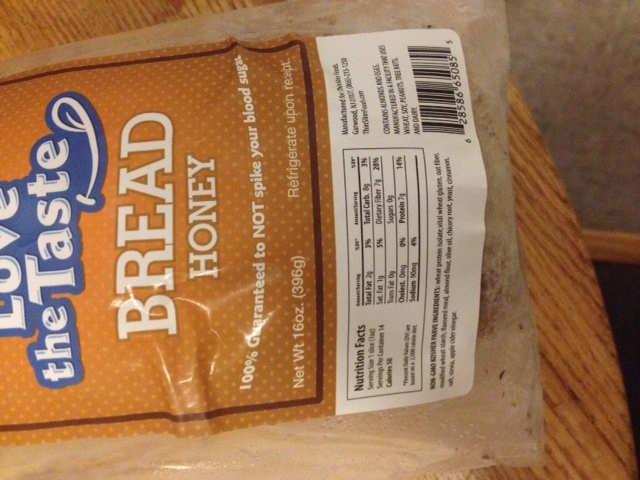 Next up, the Honey Bread. As you can see…this bread is tiny! Each piece is a little smaller than the size of my hand. 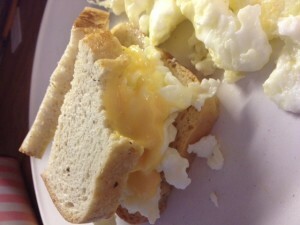 I decided to make an egg white and cheese sandwich with it. So I toasted the bread from frozen, put some brummel and brown butter on it, and made a sammy! 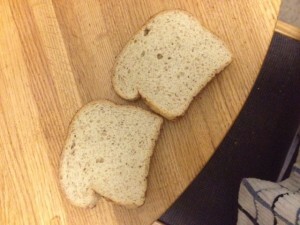 The bread is a bit bland, but versatile since you can pretty much use it for any type of sandwich or spread. 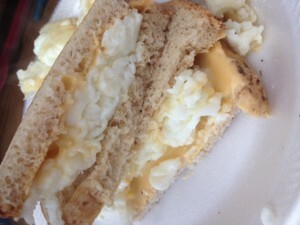 It had a nice crunch and was still fluffy after toasting. It tasted almost like a rye bread, but less dense. It had a very very TEENY flavor of honey…nothing noticeable for sure. I had a very small blood sugar spike, about 10 mg/dL, but I also have to factor in the fact I had eggs and cheese which will contribute to something. 1 slice is 50 calories, 2 grams of fat, 8 grams of carbs (7 of which are fiber), 0 grams of sugar, and 7 grams of protein. To be fair, I made the same sandwich. Overall, I think this company has some good stuff. I would love to try more in the near future, and am happy to report little to no blood sugar spikes. I also like the added protein in these products. Helps me hit my daily quotas! I got a nice shipment of new Chewy with a Crunch bars, courtesy of KIND, to do a review on! 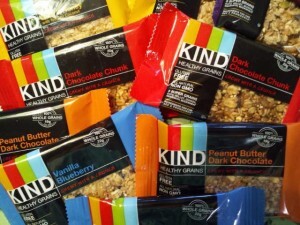 I used to be a KIND addict- they had they’re yummy granola bars with the nuts in them at my dining hall. I would use up a LOT of my “dining dollars” on those babies! So even though my diet has strayed and I do not eat those bars as frequently anymore, I was still pretty excited to try these new bars. The Chewy with a Crunch bars are gluten free, made with 100% whole grains, are non GMO, and made with minimal ingredients. So let’s get started! 150 calories, 4 grams of fat (1.5 saturated), 95 mg sodium, 25 carbohydrates, 3 grams of fiber, 7 grams of sugar, 3 grams of protein.